I’d like to say I liked this book. That it deserves its place on the Man Booker long list. But, for me? It was another look at family, which while well written, had nothing particularly fresh to say. There’s an overly dramatic mother, who favors one child over the others. There’s a conscientious oldest sister who tries to make everyone happy. There’s a son who goes overseas to help the poor and downtrodden. There’s a younger daughter who says she wants to be an actress, but all she really wants is to drink. The novel tells each of the children’s stories in a chapter of their own, beginning with Rosaleen (their mother) taking to her bed when she hears that Dan wants to become a priest. Their lives are portrayed perfectly, I think. We can imagine each person in his or her surroundings, we can fully accept their thoughts as believable and even, in places, aligning with our own. It is on Christmas Day that everything comes to a head. The five are gathered, with a spouse and grandchildren of the oldest daughter, and as so often happens during the holidays, a lovely dinner turns frantic. Rosaleen has suddenly left in her little Citroen, without any advance warning, to travel down the green road. True to form, she seems to think only of herself, and when the children finally roust themselves to come looking for her, indeed in a panic, they find themselves truly a family for at least that evening. The Green Road reminded me vaguely of A Spool of Blue Thread by Anne Tyler. But where I feel that Anne Tyler returned to her magically told stories, I feel that Anne Enright portrayed far more power in her novel The Forgotten Waltz. I haven’t had a lot of luck with this author previously. Sorry this one was ordinary for you. I haven’t read The Gathering, but I was so impressed with The Forgotten Waltz. The Green Road was good, certainly not a bad read by any means. Just not worthy of the Booker, in my opinion. I’m in the middle of Lila, and it is amazing. I may try Sleeping on Jupiter based on your review. I’d also like to read The Moor’s Account. I have heard wonderful things of Lila. My mother, in fact, encouraged me to read it in July, but I had no time with Spanish Lit Month and Paris in July. I’m looking forward to opening it soon as it comes in from the library. I can’t quite explain why I was so taken with Sleeping on Jupiter. It wasn’t a happy story, but it did give us hope. The writing was incredible, and the story different. I guess that’s why it stuck out so sharply in my mind. Before I even got to the end of your review I was thinking Anne Tyler and I have heard it mentioned that families are Anne Enright’s speciality, but I think you are right, there needs to be something that elevates a book above the rest, that sets it out from what is expected and it seems this one hasn’t succeeded to do that. I like listening to her speak and always feel that to read Anne Enright is as much a good ‘reading for writing’ exercise as anything. I like how you said, “to read Anne Enright is as much a good ‘reading for writing’ exercise as anything. Her writing is flawless, in terms of phrasing, and conveying a mood. It was the story line I felt “at fault” here, simply because I found it rather mundane. As I think back on The Forgotten Waltz what I liked about it was the gritty emotional aspect. I know there has been much praise for The Green Toad both in the UK and the U.S., andi can’t help but wonder if I wouldn’t have liked it better coming to it earlier. Alone. Not right after Sleeping on Jupiter which I adored. Remember how books we read for the IFFP would pale after a tremendous one? Finding the books is one of the hardest parts! You should see how I struggle with that for the international literature! Fortunately, our library had several, and publishers were willing to grant me access on Net Galley, but I feel your pain. Isn’t it frustrating when the library limits us?! I have the same problem. And, because I don’t review everything I have on Net Galley, I sometimes don’t get approved for titles I really want. I have The Illuminations on my list; in fact, I hope to read all the Booker long list before the prize winner is announced in October. Glad you like The Illuminations. We’ll have to chat about The Green Road, which I must admit, sits better with me upon reflection. I’m glad for this review. This kind of story has to be told in a way that makes it stand out and not just rehash what we’ve read so many times before already. So true! And, dear Caroline, I am fearful of getting to Asleep as I’m so entrenched in the Booker long list. Specifically A Little Life which seems to be 900 pages long. You’ll be patient with me, I hope, if I don’t reach our second-week-in-August “deadline”. I’m so glad you say that. I realized today I won’t be able to make it. It’s a book I want to savour. Let’s try for week three, please. OK? You’re so courageous – 900 pages! I read “The Green Road”, it is indeed very different from “The last Waltz” which I liked a lot. 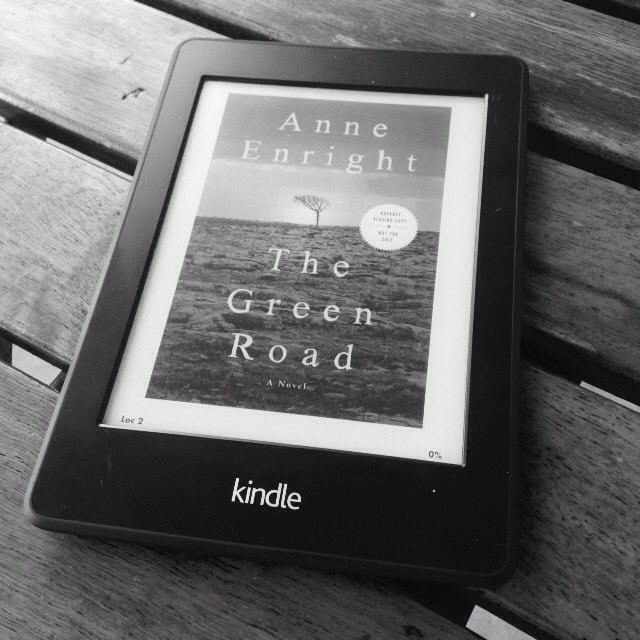 In “the Green Road” Anne Enright tries a new approach, her trademark of family life remains strong…what bothered me, was her approach to the issue of homosexuality, as if she wasn’t quite able to allow her character to be homosexual. Not wanting to give away to much I will leave it be. For some reason this bothered me. Still it is a novel worth reading…..Man Booker? Considering the competition….no. But, I agree, as compared to the competition, I don’t think this one will win. Thanks for the compliment, Madeleine. You know how often I’ve switched templates, but I like the open, uncomplicated white field to this particular one. Thank you for sharing your thoughts about this book. It sounds as if it didn’t quite live up to your expectations. I haven’t read any of this author’s work. If you do decide to pick up one of her books, I’d start with The Forgotten Waltz. She is a good writer, and I hate to leave any tarnish on her skill. I just didn’t feel that this is one of the best from the Booker long list. Couldn’t agree more! As a matter of fact, I think some of our points overlap. I waited to read your thoughts until after I posted so that I was not unduly influenced. 🙂 Nicole had a similar reaction too. I imagine we will all have more to say later. I had planned on reading this after enjoying The Gathering so much, but now I’m feeling less motivated. The Tyler might have to be next.